12:57:00 AM Dec 6th - these guys incapp very quickly; use caution! Saw pair tonight at -4846 -3678 with some workers. 9:56:00 AM does anyone know where i can find a spawn of these. 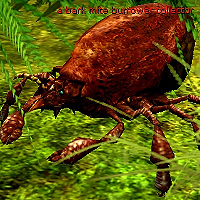 I didnt see any on my bloodseeker mite/hanadak hunt in the desert.